Peel offs are a simple addition to say what you want. 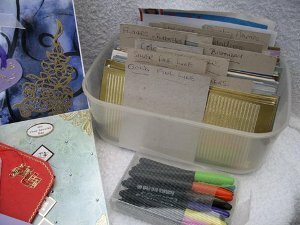 These little treasures will help you to do that easily and with instant results. 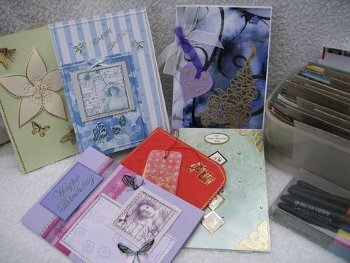 There is a large variety available to you, in lots of different colours, to add professional result to your cards. No longer just for children to use, they can be used in several ways. Here are just some examples of how they can be used. Images, borders, text, corners. They can be layered up for decoupaged effects. And with permanent marker pens they can be changed to any colour to match your design. I usually buy silver ones and colour them myself. 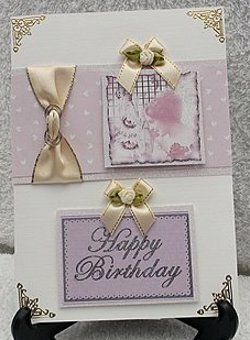 Medallion stickers can be layered up, and use coloured card or glitter card under them for sparkling effects. Apply butterflies and dragonflies to acetate. 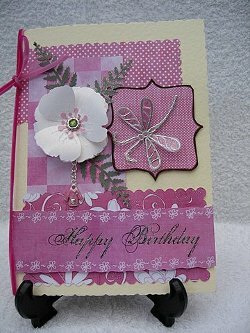 Attach to your card with foam pads or silicone, bend the wings up a little and watch them as they flutter on your card. Add some holographic glitter to the wings, and see them sparkle. 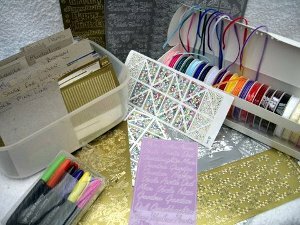 The corners on this card match the gold thread in the ribbon and make all the difference. The "Vintage" lady and the sentiment are digital downloads. A cheap and easy way to store them, use an empty, clean ice-cream tub. there whenever you need that...magic fix! Return from peel offs to Homepage.